Daily life/slice of life comics about Nano, drawn by my friend Hiro Kasuga in 2004. Encapulation of why cats rule the internet. 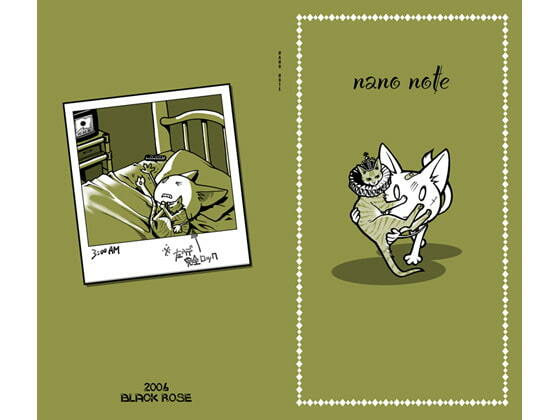 NANO NOTE, as described by B5 Alliance, is definitely for the cat lovers, showing two characters (Hiro and Dai) as they deal with the eccentricities of their cat Nano. Of course, this is a cat we're talking about, so the cat is not so much a pet to the owners as much as the owners are pets and playthings of the cat. Although the cat is eccentric, some of them are cat eccentricities rather than the specific cat. As a cat owner, I can definitely laugh when the cat jumps onto places you don't want them to be only to turn your anger into 'aww'ing how effortlessly cute they can be. My Japanese isn't strong enough to be able to read most of the dialogue and such, which is where a lot of the jokes would come from, but the situations and drawn jokes are enough to be worth the low price. Spirit of the jokes comes through even if the exact language comes through. It got several good laughs out of me, worth the price.